Eseohi Ehimiaghe, a second-year medical student, studies how excess body fat contributes to metabolic diseases on a genetic level in the lab of Grant Barish, MD, assistant professor of Medicine. Eseohi Ehimiaghe, a second-year medical student who is studying how excess body fat contributes to metabolic diseases on a genetic level, showcased her research at the Area of Scholarly Concentration (AOSC) poster session on Friday, October 13. 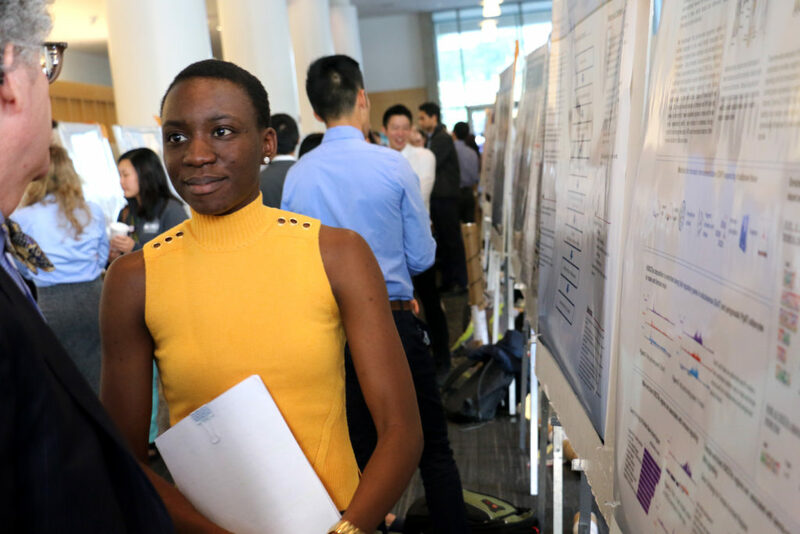 Ehimiaghe was one of more than 100 second-year medical students who presented ongoing results from their AOSC — a four-year longitudinal research project that culminates with the writing of a thesis — to Feinberg faculty, mentors and fellow students. In the current stage of her project, Ehimiaghe and her collaborators used chromatin immunoprecipitation sequencing (ChIP-seq) of acetylated histone 3 lysine 27 (H3K27ac), a histone modification that localizes to active enhancers and promoters, to identify differentially marked regulatory regions across both subcutaneous and visceral fat tissues in a mouse model. 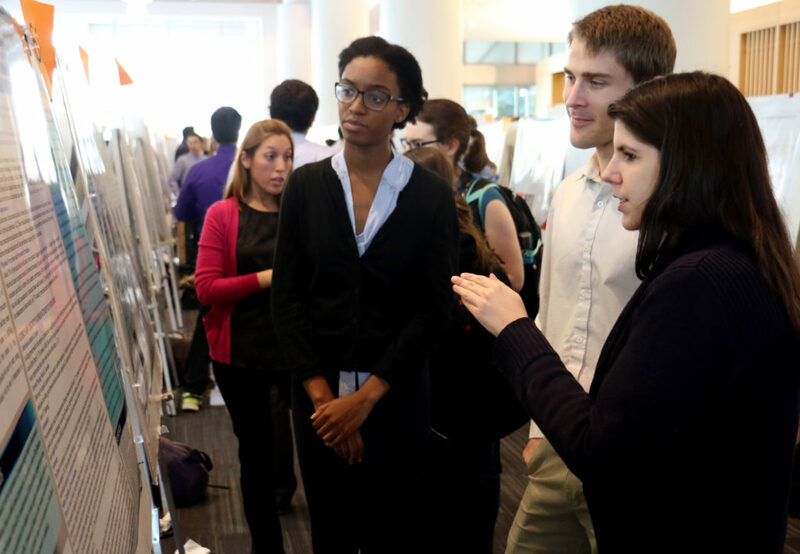 Second-year medical students presented their research at a recent Area of Scholarly Concentration poster session. The AOSC poster session included a broad range of research topics, from basic science like Ehimiaghe’s, to clinical investigation, public health and medical social science. Robert Riestenberg and Andrew Furman both chose to work on analyses of the same clinical dataset, the HIV Electronic Comprehensive Cohort of CVD Complications, for their AOSC projects. Furman is investigating differences in coronary artery stenosis between people living with HIV and uninfected controls, while Riestenberg is studying the relationship between HIV status and statin prescription practices. Both are working under the mentorship of Matthew Feinstein, ’11 MD, assistant professor of Medicine in the Division of Cardiology and of Preventive Medicine, and Donald Lloyd-Jones, MD, ScM, senior associate dean for clinical and translational research and chair of Preventive Medicine. “Researching cardiovascular complications in patients with HIV is a pretty new field, and so there are a lot of different questions that haven’t been asked yet, which is exciting,” Riestenberg said. 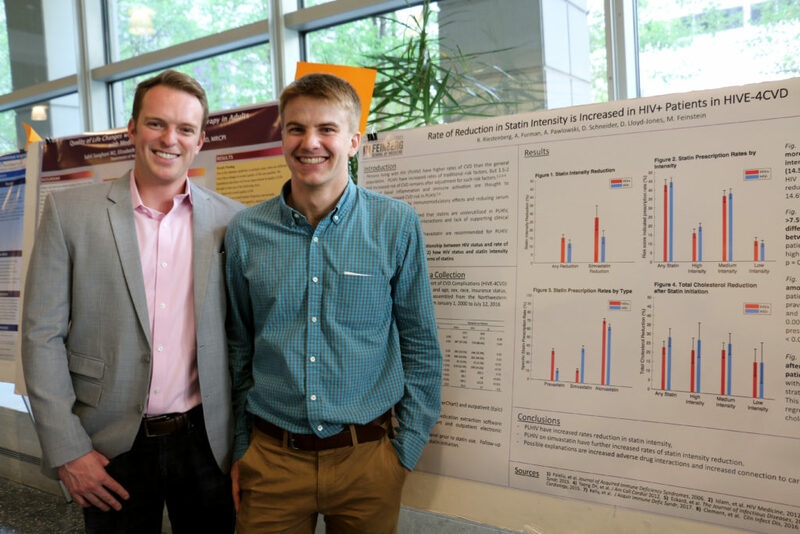 Robert Riestenberg and Andrew Furman are both analyzing a clinical dataset to answer different questions about cardiovascular complications in people with HIV. Past research has indicated that people with HIV have a higher rate of cardiovascular disease, for which the usual prevention is statins. “But there is a lot of uncertainly about how to apply statin therapy to these patients, who already tend to be on a lot of medication,” Riestenberg explained. His investigation, among other findings, discovered that there are higher rates of reduction in statin intensity in patients with HIV. “We also found that HIV patients were more likely to be prescribed statins which aren’t metabolized by major liver enzymes, which suggests that providers do seem to have a good sense of which statins are at a lower risk for drug interactions,” Riestenberg said. Monica Mehta is conducting her AOSC project under the mentorship of Roopal Kundu, ’01 MD, ’02 GME, associate professor of Dermatology and associate dean for Admissions. She is currently investigating racial differences in the perception and treatment preferences of acne vulagris, which might influence clinical care. For example, Mehta’s cross-sectional study revealed that white patients were significantly more likely than patients of all other races to visit healthcare providers and prefer prescription treatments for acne. Furthermore, East Asians, compared to other races, were more likely to receive information about acne from the internet.